Warner Bros. Pictures, December 2007, Directed by: Rob Reiner, 98 minutes, Cast: Jack Nicholson (Edward Cole), Morgan Freeman (Carter Chambers), Sean Hayes (Thomas), Beverly Todd (Virginia Chambers), Rob Morrow (Dr. Hollins), Rowena King (Angelica). 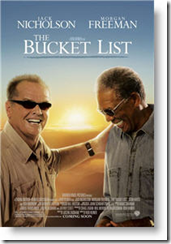 A car mechanic (Morgan Freeman) and a Billionaire (Jack Nicholson) end up in the same hospital room together both suffering from the effects of chemotherapy and both given only a few months to live at best. Carter Chambers is a family man who seems to be facing the end of his life with some regret. An obviously smart man who gave up his dream of becoming a history professor in order to raise a family. Then sacrificed for years to get his children all the way through college and into professional careers. In the process he lost a bit of himself and questions whether his wife and himself really are as close as they once were. Edward Cole is a self made selfish rich guy who demands and expects everything to be exactly the way he wants it to be. Now he was facing terminal cancer and starts out in denial and refuses to acknowledge his condition. However, soon he is doubled up in front of a toilet and is finally forced to face and acknowledge all of his fears. Carter is working on a list of all the things that he wanted and hoped to do before he died–a ‘bucket list’. When he is informed that he only has a few months at best to live he gives up on the list. Edward picks the crumpled list off the floor where Carter threw it and add a few things to it and purposes that they check out of the hospital while they have some strength and work together fulfilling the list. For Edward, it’s a joke and an opportunity for some fun, while Carter’s contributions to the list are far more introspective. There are a number of funny scenes as Edward has the two of them going sky diving. Then they fly in Edward’s private jet to Europe and eat at the best restaurants and stay the billionaire’s European villa. Then it is on to Asia. Meanwhile, Carter’s wife and family are frantic to get him back home. When Edward tries to set him up with a pretty prostitute in Asia, Carter realizes how much he misses his wife and family and asks Edward to take him home. Back at home, there is an effective juxtaposition of Carter with his wife and family all together eating and enjoying each other’s company, and Edward all by himself trying to fix a TV dinner. A real contrast in lifestyles and choices. In the process of this movie, both men end up helping each other. Carter has lived his life as a family man with faith in God and deep convictions. In conversations with Edward about the important things in life, the billionaire does not have any sort of faith and has elected to live alone with no family contact, including a daughter who he hasn’t seen for years. Carter encourages him to see his daughter and to learn how to really find joy and some kind of faith in the little time he has left.